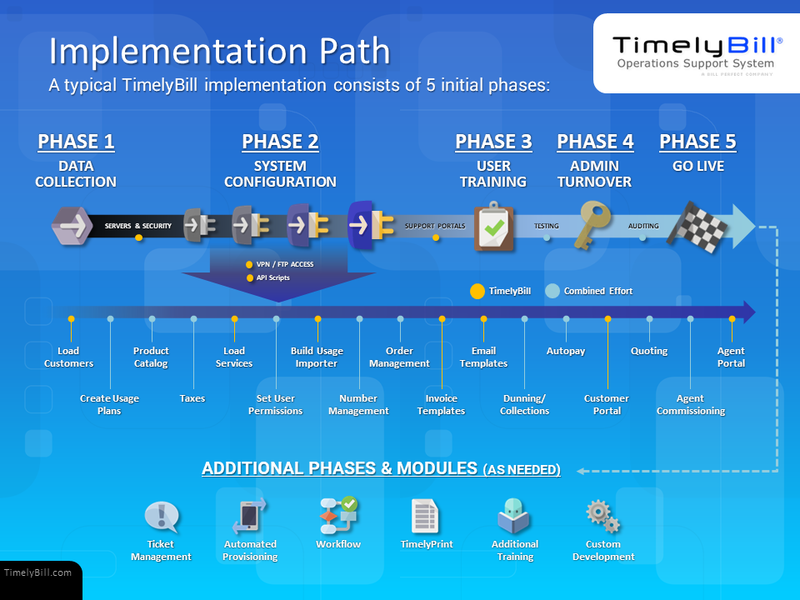 TimelyBill's implementation consists of 5 phases which are described below. We will start this phase with an initial questionnaire to determine which TimelyBill functionality, configurations and external interfaces are necessary for your organization. This phase typically starts within one day of this email, and may vary, based on factors such as the number of external interfaces and the response time for data requests. We will do our best to work with your existing data structures and formats, eliminating the possibility that you have to manipulate the data or create change requests with your existing vendors. During this period, we will install and test the application software and database to be used on your implementation. Our data conversion team will begin the development of any custom scripts required to convert your data into a TimelyBill standard. After the application server and initial data load is complete, our team will configure and customize your external interfaces, including portal customizations, and the TimelyBill GUI. The time frame for phase two is fairly consistent across our customer base, and generally won’t increase unless there are problems with third party vendor interfaces. This phase of the implementation can vary significantly based on the size of your organization or the number of “test” billing runs necessary to make you feel comfortable with your data and configuration. During this phase, the TimelyBill team begins more of a supporting role. As phase 4 begins, we will request a fresh copy of your data, and load it just prior to providing VPN and system access to your key system administrators. After providing a walk-through of the system and its configuration, we will guide the administrators on the remaining configurations for them to complete. Two examples would be user management and email server configurations. During this phase of the implementation, any fixed VPN connections will be established and TimelyBill will provide full access to the system, support mechanisms, help files, and training videos. All customers implemented after January 2011, will have on-demand video training available to their organization. Because this is a new feature of TimelyBill, we will make on-line training available as an option if the videos are not sufficient. At your requested go live date, your organization will provide us a final dump of your current data. The data will be immediately loaded and we will assist you in converting any external interfaces over to their live configurations. THANK YOU for considering TimelyBill as your back office solution.